1. Sew together a pink floral 3-1/2x6-1/2" rectangle and a green multicolor floral 3-1/2x6-1/2" rectangle to make a pink two-patch unit (Diagram 1). Press seam toward pink floral. The unit should be 6-1/2" square including seam allowances. Repeat to make four pink two-patch units total. 2. Using blue floral and yellow floral 3-1/2x6-1/2" rectangles, repeat Step 1 to make four yellow two-patch units (Diagram 2). 3. Using blue floral and pink cat print 3-1/2x6-1/2" rectangles, repeat Step 1 to make four blue two-patch units (Diagram 3). 4. Using pink floral and white multicolor floral 3-1/2x6-1/2" rectangles, repeat Step 1 to make four white two-patch units (Diagram 4). 1. Use a pencil to mark a diagonal line on wrong side of each blue vine, pink star, yellow star, and green vine 7-1/4" square. 2. Layer a marked blue vine square atop a pink floral 7-1/4" square. Sew together with two seams, stitching 1/4" on each side of drawn line (Diagram 5). Cut apart on drawn line to make two triangle units. Press each triangle unit open, pressing seams toward blue vine, to make two blue vine triangle-squares. Each should be 6-7/8" square including seam allowances. 3. Repeat Step 2 using a marked blue vine square and a white multicolor floral 7-1/4" square to make two white triangle-squares (Diagram 6). 4. Mark a diagonal line perpendicular to seam line on wrong side of each white triangle-square. 5. Referring to Diagram 7, layer a marked white triangle-square atop a blue vine triangle-square, placing blue vine triangles in opposite corners. Sew together with two seams, stitching 1/4" on each side of drawn line. Cut apart on drawn line to make two triangle units. Press each unit open, pressing seam in one direction, to make two blue vine hourglass units. Each unit should be 6-1/2" square including seam allowances. Repeat with remaining blue vine and marked white triangle-squares to make four blue hourglass units total. 6. Using marked pink star squares, blue floral 7-1/4" square, and white multicolor floral 7-1/4" square, repeat steps 2–5 to make four pink hourglass units (Diagram 8). 7. Using marked yellow star squares, blue floral 7-1/4" square, and white multicolor floral 7-1/4" square, repeat steps 2–5 to make four yellow hourglass units (Diagram 9). 8. Using marked green vine print squares, pink floral 7-1/4" square, and white multicolor floral 7-1/4" square, repeat steps 2–5 to make four green hourglass units (Diagram 10). 1. Referring to Diagram 11, sew together four pink two-patch units, four blue hourglass units, and a seasonal cat print 6-1/2" square in three rows. Press seams away from hourglass units. Join rows to make block A. Press seams in one direction. The block should be 18-1/2" square including seam allowances. 2. Using yellow two-patch units, pink hourglass units, and a seasonal cat print 6-1/2" square, repeat Step 1 to make block B. 3. Using blue two-patch units, yellow hourglass units, and a seasonal cat print 6-1/2" square, repeat Step 1 to make block C.
4. Using white two-patch units, green hourglass units, and a seasonal cat print 6-1/2" square, repeat Step 1 to make block D.
1. Sew together blocks in pairs. Press seams in opposite directions. 2. 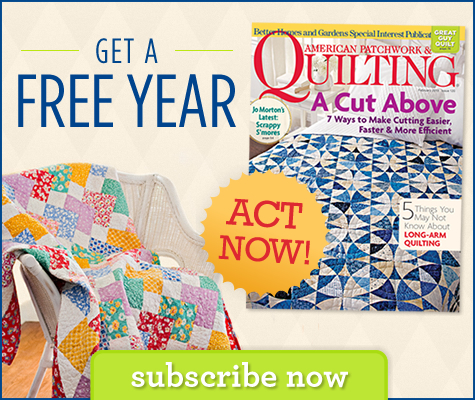 Join pairs to make quilt center. Press seam in one direction. The quilt center should be 36-1/2" square including seam allowances. 1. Referring to Quilt Assembly Diagram, sew yellow star print 1-1/2x36-1/2" inner border strips to opposite edges of quilt center. Add yellow star print 1-1/2x38-1/2" inner border strips to remaining edges. Press all seams toward inner border. 1. Layer quilt top, batting, and backing; baste. Quilt as desired. 2. Bind with blue cat print binding strips.